Well, as per the believe, the smoke which arises on burning of traditional Chandan Incense Sticks, carries one's prayers to the god. Here Chandan incense sticks plays an important role. Some other purposes for burning incenses sticks are air purification, masking of smells that are unpleasant, providing inner harmony, and many others. As per the latest survey and research, the soothing odour of traditional Chandan Incense Sticks make a person feel more active and conscious. When you are surrounded by delectable fragrances, then it apparently causes the cells to trigger signals and stimulate various physiological responses, and additionally it helps cutting down the stress level and enhance your health. 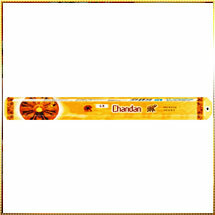 Buy our Chandan Incense Sticks at very reasonable prices.